(NEW YORK) — Helicopter parents may hover and tiger moms may roar, but make room for the lawnmower parent whose approach to child-rearing is generating buzz. “Lawnmower parents go to whatever lengths necessary to prevent their child from having to face adversity, struggle, or failure,” the teacher wrote. The post, titled “Lawnmower Parents Are the New Helicopter Parents & We Are Not Here for It,” has been shared 12,000 times on the brand’s Facebook page. The teacher, who wrote it, told a story of a seemingly reluctant father who dropped off a water bottle for his child at her school. “I took a deep breath through my nose. ‘Oh, I have one of those — I love mine, too,’ I said. But I’m pretty sure my eyes were saying, ‘WHAT ON THIS ACTUAL EARTH,'” she wrote. Named after the device used for cutting grass, a lawnmower parent will intervene or “mow down” any person or obstacle that stands in the way of them saving their child from any “inconvenience, problem or discomfort,” according to a college professor who wrote a blog on the subject. In that same blog, the professor notes how helicopter parenting is widely known for parents who hover or swoop in to “rescue” their kids whenever they’re in trouble. 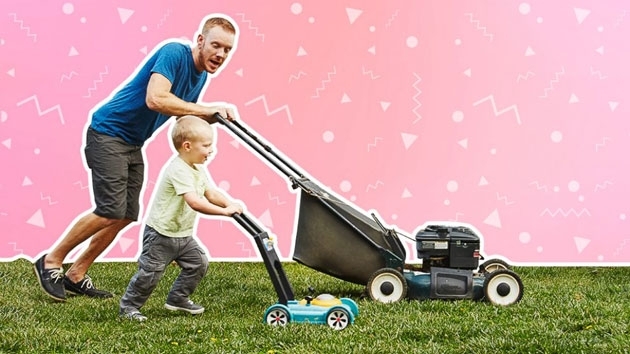 Lawnmower parents, however, are geared more towards parents of older children where hovering “may be limited,” she wrote. Samar told Good Morning America that focusing on short-term parenting goals will take away from the practice of important, long-term goals that kids can benefit from like resilency, grit, problem-solving, conflict resolution and coping skills. “The parents of these students may, understandably, try to remove struggles and challenges from their child’s life because they’ve seen the way their child has responded to other struggles and challenges in the past,” the teacher explained. Samar said since every child isn’t at the same level make sure you know, as the parent, when and how to step in. Elisabeth Fairfield Stokes, a mother of two, told GMA that she has heard of a parenting style like lawnmower, but it was referred to as “snowplow” parenting. “I believe in being involved, in being aware in what’s going on and I don’t mind if that’s perceived as hovering,” Stokes said.